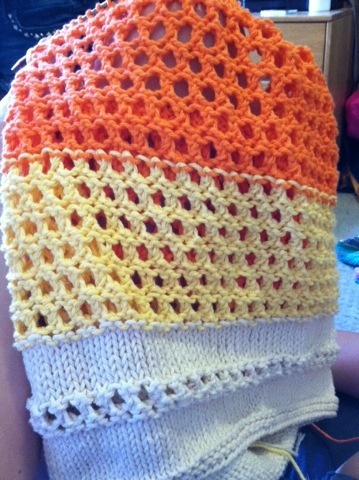 It turns out the beach bag that I decided to knit before finals week (who need studying?) was one of the most useful things that I took on my trip to the beach. 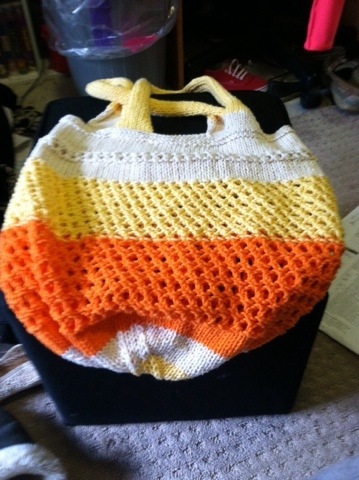 Aside from being candy corn tropical themed, it was also the ideal beach bag. I figured that it would maybe fit a towel and then a water bottle easy. I would maybe have to carry a spare towel and my sunscreen, no big deal. I could not have been more wrong! That thing stretched to carry everything! And when I say everything, I mean it. I had two towels in there, two cans of sunscreen, a bottle of aloe, a water bottle (one of the BIG ones), and a little bucket for collecting seashells. Even with all of that, there was still lots of room left over. It also held up reasonably well even with all of the heavy lifting that it did. No unraveling over here! My ends started to poke out a bit, but I figure that’s partly because it’s an openwork pattern, and partly because I have a sneaking suspicion I don’t weave my ends in right. Other than that, the bag held up wonderfully. Sand also fell right through it, which was another giant plus. The only bad (ish) thing about it is the awkwardness of having all that stuff to carry. The bag is so stretchy that when it’s stuffed with everything and anything it ends up looking like something a quintessential bag lady would carry around. But I suppose that is the price I have to pay for being able to haul my entire life around; and if that’s the only drawback with this pattern, I’ll take it. Ah, finals week is finally drawing to a close and my trip to the beach almost here! I’m so excited! 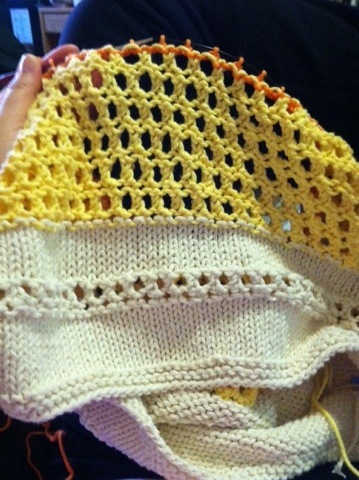 But there’s an unfortunate drawback of going to the beach…no knitting projects! I don’t know how I’m going to do it, a entire week without any busy work to occupy my hands! I guess that’s alright though, I’ll be too busy relaxing and enjoying the sun! And thinking about new knitting projects to start of course! I do have several projects to finish as well (A serial problem of all knitters, I think) and those will need to get done as well! 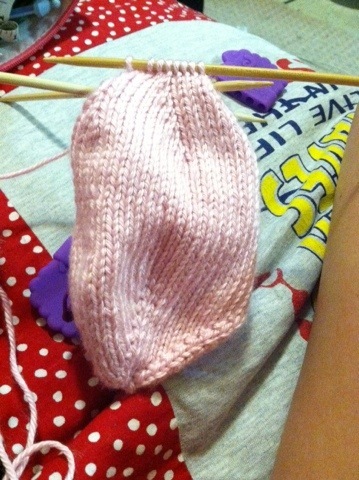 I do have a single sock that needs a mate…perhaps that will be the first thing I start up on! Hopefully the next time I post it will be with pictures of a pair of socks and not just a sad single one! Last month or so, my boyfriend and I were invited to go to Myrtle with a large group of people. Naturally I was very excited (it’s the beach, who wouldn’t be?) and decided that I would probably need some things before I could go. On this imaginary list was, among other things, some kind of beach bag. Once I started to think about it I decided that it might be easier to make one rather than actually looking around in a store for something. I also don’t like to pay more for things that I can just as easily make, so that was a factor as well. I had no idea what exactly to make and how, so I went to ravelry and started to search around for the right pattern. I looked at a few that I thought might work, and then I found a wonderful wonderful pattern called “Not A Sandy Bottom.” This pattern looked easy to work up and had a lovely open work stitch for the body that I thought would really stretch well. I’ve already finished this project and I can say that it was an awesome pattern. 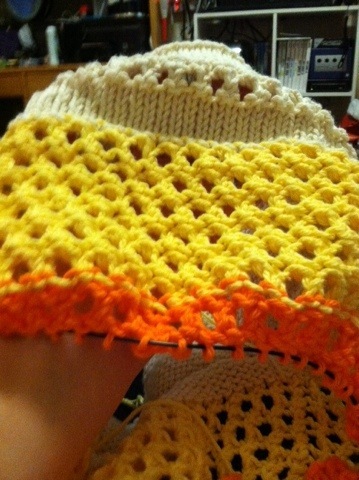 The only thing that I changed was to add four more rows of the open work stitch to make it just a bit bigger. The pattern calls for sugar and cream cotton yarn, but I used the cheaper version that Walmart sells instead and it worked out just fine! I also managed to pick out colors that I thought were tropical, but are, in fact, the colors of candy corn. So, I guess my bag can be interchangeable with summer and Halloween! Okay, so the pig is finished (it has been since a few weeks ago but my wifi is spotty and prevents me from posting any type of picture -_-) and it was very well received! My aunt loved it and we all decided that her new baby loved it as well, even though she was more concerned with being cranky at the time…but, without further ado, here is the finished product and some of the knitting leading up to the finished product! 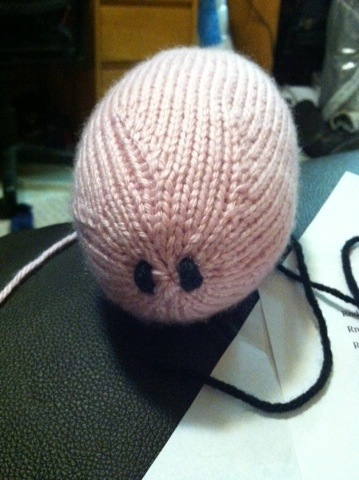 The second picture is before I sewed any of the little guys body parts on so he looks a little bit like a pink turd! In my last post, I said that I was going to (eventually) start another pig! And earlier this week, I found the time and started the little guy! The pattern is still from Knitting Mochimochi, but I think I’m going to try and tweak it here and there to make the pig easier to do. 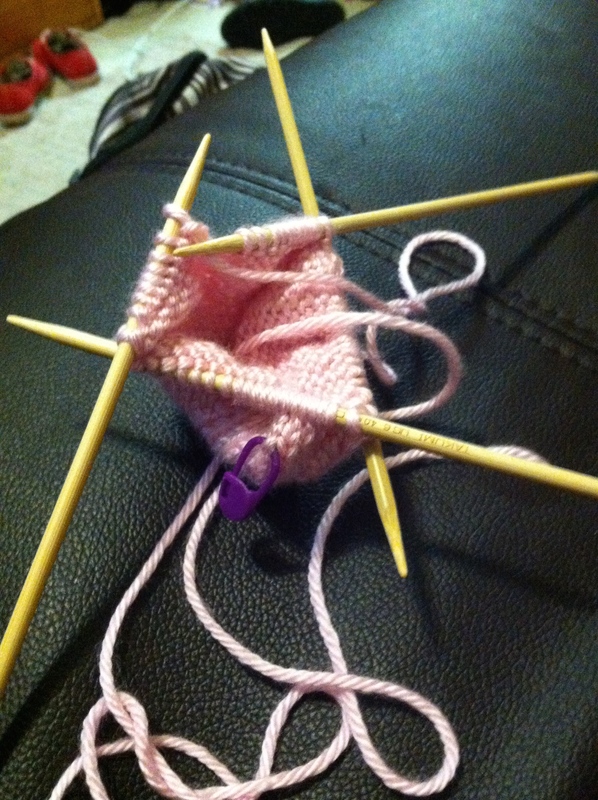 It’s knit on double pointed needles and I seem to have the problem of making my stitches too loose when I switch from one needle to the next. I haven’t figured out why this happens, but I’ve fixed it for the most part by pulling the yarn tight enough over each join. Back to the pig though! 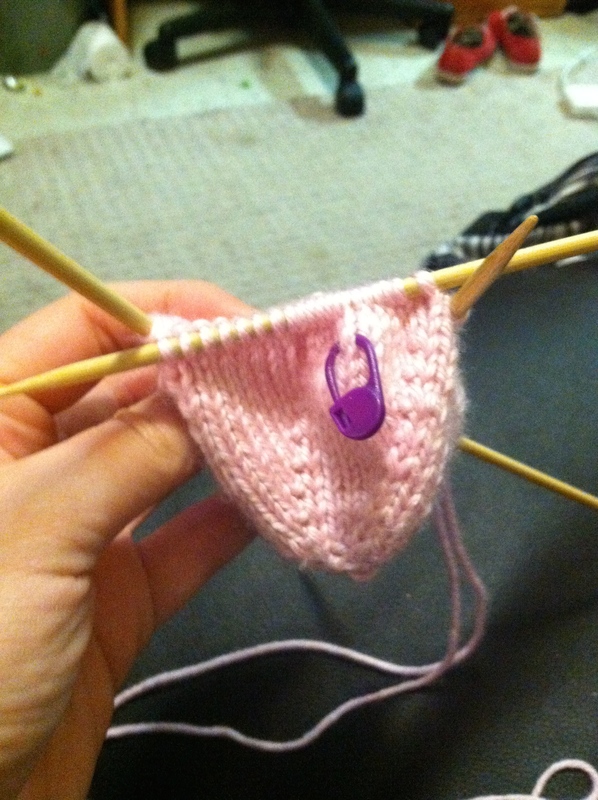 What I’m knitting right now is actually the business end, so it makes for an…interesting project! Aside from that, it’s going really well, and I think it’s going to turn out better than the first one that I made. I do have some pictures of what I have so far, and I’ll keep updating on that, as long as I don’t forget! The yarn that I’m using is Caron Simply Soft, but I don’t remember what color it is…some kind of lighter piggy pink color. So, I recently found out that I could check books out online from my local library and most of the books that I have checked out so far have to do with knitting. All types of knitting, in fact. The books that really caught my eye were the ones that had to do with knitting little toys. I found tons of patterns that looked adorable and would force me to knit something other than, you know, a scarf. The first book that I checked out and actually completed a pattern from was Hansi Singh’s “Amigurumi Knits.” The second book of toy patterns that made its way onto my library card was “Knitting Mochimochi” by Anna Hrachovec. This book is where I found a pattern for super cute (and super fun) Pigs with Wigs! I loved the fact that the title of the pattern rhymed, and the fact that it seemed like a child (and adult) friendly pattern that would be easy to whip up. So I tried it! And the little guy came out wonderfully, but I’m already planning on making another pig with a wig (I just can’t get over the rhyming!) for a newborn cousin. I know that she might not appreciate the verbal wordplay, but I figure she might enjoy the stuffed animal when she’s a little bit older. So I have decided to chronicle the making of the pig right here! 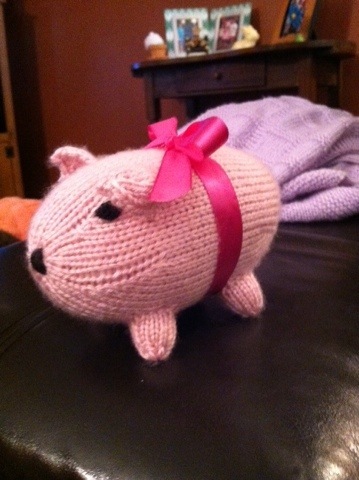 The first pig turned out very cute, but I’m going to see if I can tweak the pattern to make this guy even better! The plan is to post some pictures along the way, as well as terrible jokes and wordplay. 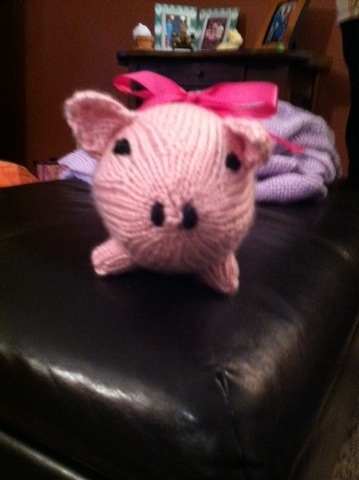 That’s all for now though, hopefully the start of the pig will come soon, since it has to be done for Easter!